It started with a fluke and ended with a flurry. 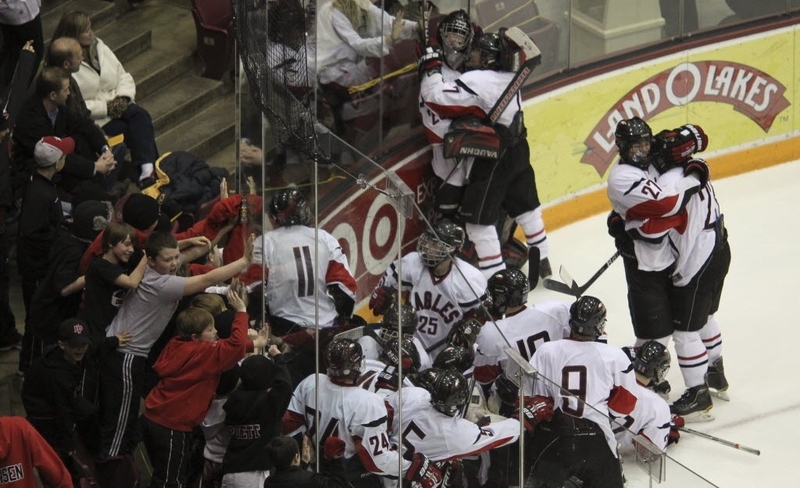 Kyle Rau's goal with 7 minutes, 41 seconds left in the second overtime lifted Eden Prairie to a 4-3 victory in the Class 2A, Section 6 championship at Mariucci Arena, capping off a wild game of hockey. On the game-winner, Rau gathered the puck in front of Wayzata's crease, toe-dragged it back 3 feet and let a shot sail into the back of the net. After the on-ice celebration, Rau let out a high-pitched yelp when asked by reporters about his clutch goal. "We knew it was our game," he said. "We were gassed, but so were they. There was no panic." It was fitting that this one went to overtime given the odd way the scoring started. Eden Prairie took a 1-0 lead less than three minutes into the second period on what soccer enthusiasts would call an own goal. Dan Molenaar dumped the puck into the Trojans zone, and when a Wayzata defenseman went to clear it to the side, he instead put it past the goal line off Aaron Dingman's skate. "Puck luck," Eden Prairie coach Lee Smith said. Mason Bergh gave Eden Prairie a 3-1 lead early in the third before Wayzata turned on the jets to force overtime. Mario Lucia and Bryan Tabery scored 1:35 apart, with Tabery's tally coming with 7:39 to play. The Trojans then owned the majority of the scoring chances in extra time but were never able to convert.